Searching for John Hughes is among the finest tragedies in the brave new genre of memoir wherein the author’s own life is reflected in the undertaking of a biography fail. or what passed for bad in the suburbs. Like Diamond, I sought refuge among punks. Like Diamond, I was deeply interested in the fact that John Hughes, writer and director of several of the unarguably best and most timeless teen movies ever made, lived among us. You might run into him at the Jewel-Osco. He might be getting gas at the 7-Eleven. But I never searched for him. 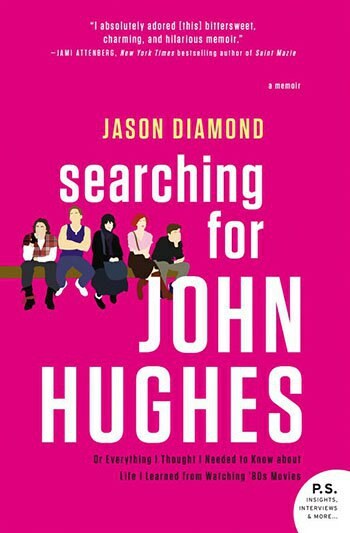 Searching for John Hughes is the supremely excellent result of Diamond’s quest to hold on to his own optimism. He failed spectacularly for many years at writing a proper biography of Hughes. That first manuscript was ultimately “wedged somewhere between cultural criticism, essay, and a manifesto” (126). Diamond failed for many reasons and in many ways -- personal, chemical, professional, circumstantial, and surreal. Some of the manuscript’s failures were swift and self-evident, others were agonizingly slow and grew multi-faceted over weeks or months or years. These failures ultimately came at great cost to the author’s life. “I had a book that I’d been working on for a few years, one that I’d spent money I didn’t have on, lost jobs chasing interviews I didn’t end up getting, moved halfway across the country, all because I’d told myself it would all be worth it in the end” (226). “How many more times could I tell myself there’d by a happy ending?” (82). Indeed, Diamond always finds a way to take one more stab at his homage to Hughes, both for Hughes and for himself. “I kept getting on a plane to O’Hare because I’d wanted to see if things could work out. I’d wanted to see if there was any possible way of having the life I thought I could lead when I was young. […] Despite everything, I’m an eternal optimist. It’s both a strength and weakness” (267). Through his work on the book, Diamond revealed to himself a variety of connections with Hughes’ oeuvre. “And the more I drove around his suburbs, the more it dawned on me that I was driving around the places where my own memories were born, how his life and mine, although thirty years apart in age, shared a similar geography. […] I was looking for John Hughes, but subconsciously I was starting to understand why I felt such a deep connection to his film, and also why I’d decided writing this book was my destiny: I wanted to live in a John Hughes film” (183). It wasn’t only that the author found himself intertwined with the filmmaker’s work, as he had been since his teens. He also found himself increasingly woven into the fabric of the filmmaker’s life. “When Hughes was toiling somewhat fruitlessly at the ad agency in Chicago he was in his twenties. When I was writing about him and that job and his climbing the ladder in that city that had raised us both, I was also twenty-five, just another young person looking to write chapters and chapters full of triumphs -- either his or mine” (146). But the biography never quite gelled. Diamond simply didn’t have the connections needed for such an enormous undertaking. “Like Hughes, I had all these ideas, but they were useless without all the little things I was trying to find out, like if his father served in the military and whether Hughes was a good student. Those details that I just didn’t have the resources to get were so crucial. Those were the things that made a biography” (157). It’s so easy to see the runaway train of oncoming failure, to hear it screeching in the near distance, yet Diamond can hardly stop himself from one last gasp and one more try on every page. What’s harder to understand is why he dove into the project in the first place. “Faith had never really played a part in my life, yet there I was, over a decade later, sitting in a bar and telling my friend that I wanted to become a holy man. […] There was no vision of Moses in my toast, no sudden and inexplicable interest in ancient Jewish texts; I just wanted to be a rabbi. It sounded like an admirable profession, like how some people wake up and decide they don’t want to be a stockbroker or some other shady profession, that instead they’d rather do something good” (201). Diamond is in search of salvation by almost any means, returning to the root of Hughes as a primary cultural influence. And he’s also bluffing his way through a confidence game with some successful jackasses with whom he went to high school. “’I’m writing the unauthorized biography of John Hughes,’ I said with the kind of authority I didn’t even know I possessed. [..] That sounds really cool, I thought, the lie turning into an actual plan right there on the spot. Really cool. I would write the John Hughes biography that nobody else had ever attempted. I would pay the highest tribute to a man whose work had such a huge impact on me, whose vision I had basically based my world view on. This was my big idea, the one I came up with while drunk and lying” (120). What begins as tribute naturally transforms into something more grounded and therefore necessarily more critical. “I found myself disliking a lot of things about the guy who was supposed to be my hero. […] It felt as though the belief system I’d built for myself, the idea of a better life that I wanted, all hinged on me figuring out what really happened, why he either sold out or just faded away” (215). Diamond is slowly but steadily killing his darling, walking that complex, fine line between homage and homicide in engaging one of America’s foremost cultural icons. “My relationship with Hughes was more complicated than I had thought when I started out, and I liked that. I liked that I found fault in his work and in the man himself. […] My feelings on Hughes and his work went from obsessive fan to obsessive critic, but I still felt an undeniable link to him and his movies. They had helped shape me” (248-9). Though it had helped keep him alive when he was younger, there are a pile of signs that it had begun stunting his growth. “I had wasted half a decade. I was sitting there with that untouched plate of food in front of me, in a town I didn’t know, jobless and close to being broke, and I was stalking the guy who played Jake Ryan even though my book was about the life of John Hughes. I’d been going about things the wrong way, I thought. I’d become a total creep, and to be honest, I wasn’t even sure I wanted to keep doing this anymore” (233-4). And there’s a terrific breed of irony embedded in that complexity, too, in the ways this book project threads through his life as a grown man. “All told, my John Hughes biography was the best and longest relationship I’d had as an adult, and thinking about that made me queasy. We spent long nights together, sometimes I’d confess to it through my writing, letting parts that were supposed to be about Hughes become more about me, my own views, my own thoughts, my own fears” (243). Diamond anointed himself chosen for this work. He needed it and felt it needed him, and yet, “when the one agent I did talk to at a ‘Meet Publishing Insiders’ event I paid fifty dollars to go to, which had been moved from a larger venue to a smaller bar with a faux French bistro vibe, asked me why I was the person who should write a biography on such a famous and beloved director, I was taken off guard for some reason” (155). He was simply called to it, unambiguously but without concrete reasons. Many times he was challenged by this work, facing one defeat after another and often losing his resolve. “To think I had come so close to giving up! I was one step closer to John Hughes, one step closer to making my biography a reality. […] And then I got a flat tire just outside of Jersey City, surrounded by smokestacks, like a living Bruce Springsteen song” (228). Searching for John Hughes is among the finest tragedies in the brave new genre of memoir wherein the author’s own life is reflected in the undertaking of a biography fail, in the process of describing why some other book about some more important person did not materialize. As with all such books -- Geoff Dyer’s Out of Sheer Rage, or Alina Simone’s Madonnaland, for example -- the human succeeds where the book project fails. And on the human scale by which Diamond gauges his success, “Andie [of Pretty in Pink] was the first John Hughes character I wanted to be. Getting through all the crap and coming out awesome, to me, was the coolest thing anybody could do” (40-41). Did Jason Diamond get through all the crap and come out awesome? Yes, he did. “I was becoming an adult and it didn’t feel as though my heart was dying. I’d spent years failing, but I realized I had basically failed upward” (275). We cannot ask for more. We all define ourselves through popular culture. Diamond is just like me, but it isn’t because we’re of the same generation or because we grew up in the same suburbs, or even because we have a similar cultural frame of reference. The process of referencing -- this searching labor of love, how it fails us and why we need it anyway -- is itself universal. For better and for worse, we are married to the icons given us in our youth. Diamond is keeping the faith.